werewolves won’t be able to get through the front door, what with not having opposable thumbs. Anyway, there’s no full moon this Halloween, probably. But what about zombies? Surely the zombie apocalypse could never happen. Zombies don’t exist. Or do they? Zombies first graced the silver screen in the 1930’s film ‘White Zombie’, in which heroine Madeline is turned into a zombie by a Haitian Voodoo master – played by cult horror actor Bela Lugosi – in order to take away her will power and compel her to marry a man she doesn’t love (forced marriage as light entertainment arguably being the creepiest thing about the movie). According to wikipedia, the film was derided as ‘over the top’, which is kind of surprising given that Haiti is actually one of the few places in the world where belief in zombies is common. According to traditional Haitian Vodun beliefs (known to us as voodoo), a person is made up of three aspects: the physical body, an animating presence – which keeps the body moving – and awareness, most similar to will. It’s believed that if a voodoo sorcerer, called a bokor, captures an individual’s awareness shortly after they’ve died, they can control the physical and animating aspects of that person, essentially bringing them back to life as a zombi cadavre. This might sound quite cool, but returning from the dead is more Buffy the vampire slayer than Gandalf in this case, as the resurrected zombie is a slave to the bokor, with no will of their own. This belief is so widespread in Haiti that zombification – the technical term, believe it or not – is classed as murder. What’s more, anecdotal evidence suggests that there are as many as 1000 new reports of zombification on the island each year. So what’s going on? It might be Halloween, but we’re still scientists here. Ruling out magic for the moment, there have been two other theories proposed which have the air of plausibility about them. First up is poisoning. An anthropologist called Wade Davis who visited Haiti in 1983 found that the bokors were keeping some pretty hefty poisons in their possession. He proposed that the initial state of ‘death’ – which would likely be a coma – could be brought about by a toxin called tetradoxin, a paralysing agent found in puffer fish. 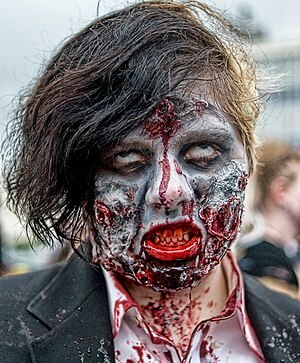 Once the ‘zombie’ had come round, a passive state could be maintained by ingestion of a plant called Damura Stramonium, which has hallucinogenic properties. In theory, the zombie could be kept as a slave indefinitely in this manner. Creepy stuff. Subsequent studies have pretty much pooh poohed this theory, as minimal amounts of tetradoxin have been found in bokor zombie potions. However, it is has been suggested that misdiagnosis of death by the locals followed by ingestion of Damura could bring about a zombie-like state. A more likely scenario was proposed by a paper in the Lancet in 1997. After a visit to Haiti and a case study of 3 ‘zombies’, researchers concluded that severe mental health problems were to blame for the ‘zombified’ state of the individuals they studied. What’s more a culture in which people are hypersensitive to the perils of being zombified had led to grieving families mistakenly identifying ‘zombies’ as dead relatives in two of the three cases. So, rather than poisoning and slavery, it is more likely that mental health problems and mistaken identity are the cause of many reports of the walking dead in Haiti. Does this mean that, assuming we do not fall victim to Haitian Voodoo doctors, we are safe from the zombie apocalypse? About as safe as Jamie Lee Curtis wandering around a house on her own in the dark with no bra on. …and they live on your skin. Sure, it’s probably unlikely that zombies will break into your house and tear you limb from limb this Thursday. Slightly (but only slightly) more likely is the chance of contracting a nasty disease called necrotising fasciitis. It’s easy to see why they called it flesh eating disease…. Necrotising fasciitis, or flesh eating disease, does exactly what it says on the gory tin. Over the course of a few days, the skin and muscle layers below undergo necrosis – the cells making up these vital body parts die. It can be fatal if not caught early and treated with surgical removal of the infected area and tons of antibiotics. But catching the disease in time can be tough. For one thing, the necrosis normally starts under the skin, so you might not be able to see the warning signs right away. Second, it’s so rare that doctors can easily misdiagnose it. A recent review highlights the need for early diagnostic tools, but to date none have been forthcoming. 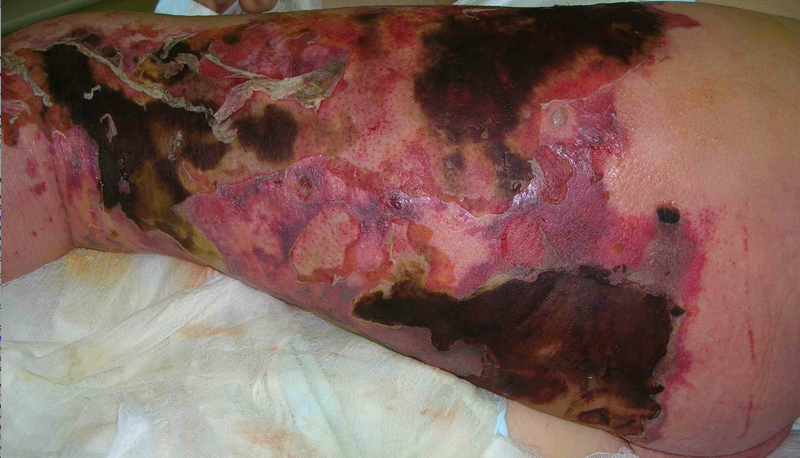 As a result, flesh-eating disease has the almost same mortality rates today as it did a century ago. The cause of this disease varies, but is often an innocuous little bacteria called Streptococcus pyogenes, which is an ordinary part of the bacterial flora that live on your skin. Infection occurs if the bacteria get into the body through a cut or puncture. It can also arise due to everyone’s least favourite hospital superbug, MRSA. There’s no doubt that necrotising fascitiis is a mean little infection, but the chances of contracting it are pretty slim – about 500 cases are reported each year in the UK. So there’s probably no need to contemplate removing an arm a la Bruce Campbell every time you get a paper cut. Probably. But don’t get too complacent. We ain’t out of the haunted woods yet, guys. And I’m not talking about Bruce Forsyth here. Cotard’s syndrome is a rare psychological disorder which causes ‘nihilistic delusions’. This means that people with Cotard’s believe that body parts are missing, or decaying. In some sufferers, the syndrome can even manifest as a belief that they are no longer alive – they literally believe themselves to be the walking dead. Cotard’s syndrome is often linked to severe depression, which is understandable given Graham’s description of his feelings. Brain scans revealed minimal activity in Graham’s brain – the patterns revealed by the scan were more similar to those of someone under anaesthetic than to a walking, talking person. The rarity of the disease makes it hard to study, but experts now suggest that a combination of suppressed brain activity and other mental health problems may be responsible for triggering Cotard’s delusions. But the true causes certainly aren’t clear. In what I shall refer to politely as a ‘routine media health scare alert’, the Independent claimed earlier this month that the cold sore cream Zovirax could cause Cotard’s in certain people. However, having had a quick look at the paper, the data seems to be anecdotal at best. The research found seven people with renal failure who showed symptoms of Cotard’s after using Zovirax. But the definition of Cotard’s in this case seems to be quite loosely defined, and this is seven people in all of medical literature, ever. So I won’t be losing sleep over that just yet. This entry was posted in evil science, science and tagged Cotard's syndrome, Haitian Vodou, Halloween, Necrotising fasciitits, Zombie by allinthegenes. Bookmark the permalink.